Home »Catalogue»Beta Recordings»John B “Red Sky” REMIXES Out Now! New Drum & Bass Remix courtesy of Subsonik & Smooth, plus Dubstep Remixes from John B himself & Rebel Sonix, available now on RED vinyl from all good retailers, and the Beta Online Store. mp3s are available in all the usual places like iTunes and Beatport. CLICK HERE to buy Red Sky D&B Remixes on Red Vinyl from the Beta Store. CLICK HERE to buy Red Sky DUBSTEP Remixes on Red Vinyl from the Beta Store. CLICK HERE to buy signed test pressings of the remixes from the Beta Store. In demand producer John B’s ‘Red Sky’ is about to be re-released as part of a brand new remix package. ‘Red Sky’ has received incredible renewed hype following it being sampled on huge US star Nicki Minaj’s ’Here I am’ from the already gold selling album ‘Pink Friday’. A massive drum and bass hit in 2008, ‘Red Sky’, is now going to be propelled into a different stratosphere, and it comes with brand new exciting remixes to match. Dubbed rap’s answer to Lady Gaga, Nicki Minaj’s album is anticipated to be one of the highest selling albums worldwide of 2010/2011: skip to track ten and you will hear John B’s distinctive trance and bass fusion pounding through reigniting interest in what has already become a classic Drum & Bass dance floor smash. John B himself is a well known international superstar DJ who has been playing a non-stop global tour for over a decade. In-between taking his unique sound (and make-up bag) to every corner of the world, John is known for his genre defying production talents. 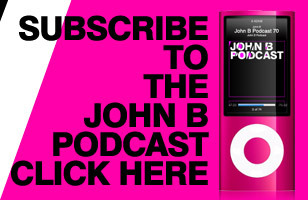 The John B Podcast is going from strength to strength, pushing John’s signature electro/trance influenced high energy Drum & Bass sound, getting up to 200K downloads per episode & has been a major factor in his ever-growing worldwide fan-base. On top of running his own labels Beta Recordings & Nu Electro, he has produced tracks featured on Paul Oakenfold’s Perfecto Label, recently remixed chart topping bands such as Pendulum & Bloc Party, and produced a pioneering ‘Trance & Bass’ remix for Michael Cassette on Anjunabeats. Currently ranked 76th best DJ in the world in DJ magazine’s influential Top 100 Poll, 2011 is going to be a huge year for John B and ‘Red Sky’. 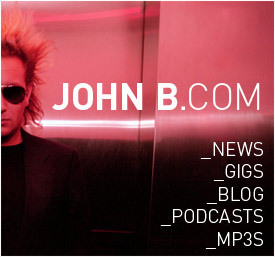 John B new album will be released in late June, and will be followed by the first of a new Mix CD series, Trance & Bass 2011. ‘Red Sky’ is being re-released in Febuary 2011 and comes complete with dubstep, trance and drum and bass remixes from John B himself and cutting-edge producers Rebel Sonix, and Subsonik & Smooth. ← Previous Previous post: Xilent “Pure EP” Out Now! Next → Next post: Gemini “Destiny b/w Without You” OUT NOW!